Arrived at the lay-by just before West Witton, after excellent Bacon Rolls at Ron's house, to depart at about 8-50. Through West Witton and up to the Caravan Site where we saw the damage that the recent gales had caused. Continued past the remains of the chapel to follow alongside the lower Aysgarth Falls. Followed the footpath crossing the disused railway to arrive at Castle Bolton, which was crowded with lots of 4x4 vehicles for a Dog show. Continued through the village to drop down to Redmire for a lunch stop at the Bolton Arms. Once the beaters from the local shoot left, the pub stop turned into a very enjoyable break where many pints of "Timothy Taylors Landlord" and "Black Sheep" were consumed by all. After loosing the footpath and having to cross a few swollen becks, our journey took us down to cross the River Ure at "Lords Bridge" in the Bolton Hall Estate and back to the cars. Weather: Very damp and muddy with a little light drizzle at times. The rain set in shortly after we had finished!!! 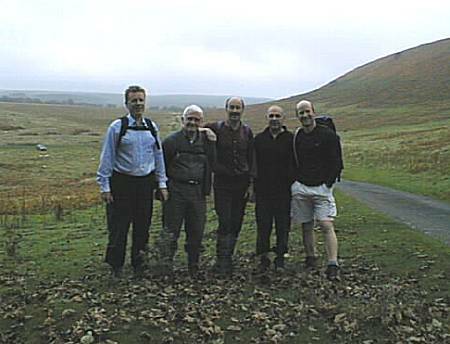 Walkers: Ron, Neil, Alan E, Alan J, Sean, Cliff (leader) & Alan 3 from Thoralby. Distance: 16 miles with 4,259ft of climbing. Weather: Cold & Crisp, but sunshine most of the day. Walkers: Ron, Alan E, Alan J, Neil, Colin, Sean & Cliff. Distance: 17.6 miles with 1,213ft of climbing. Parked at the Bird Sanctuary just north of Masham and after a short observation of the birds from the hide, departed at 8-30am on route to Low Ellingham, but were hindered by the giant gravel working in between. After a complete tour of the workings we chose the road route to continue through Low Ellingham, following the river via Squirrel Bank, crossing the bridge near Kilgram Grange, to walk on to Thornton Steward. Whilst not sure of the route at one stage, Colin was bitten by an angry farmers dog, which tore his trousers and drew blood. Leaving Thornton Steward we continued through Danby Grange to arrive at the Coverbridge Inn around 12-30, before the lunchtime rush. 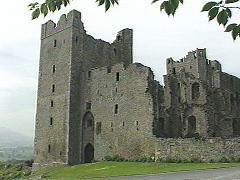 Greatly enjoyed 4 pints of ale and a number of bags of crisps (for Ron). Alan practiced his forthcoming grandfatherly duties by holding 10 month old Annabel for some time to assist the family on the adjacent table. Left the pub at a late hour to walk back via the grounds of Jervaulx Abbey, though High Ellingham and some interesting routes to return to the car at around 5pm. Weather: Heavy drizzle during the morning and overcast all day. Walkers: Ron, Alan E, Neil & Colin. Distance: 16.8miles with 2,412ft of climbing. 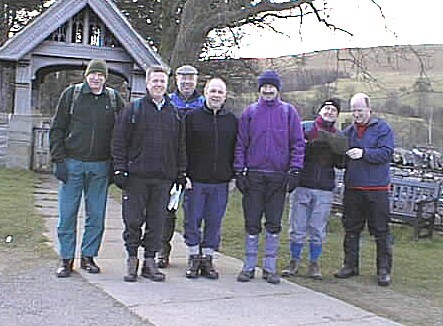 Set off from the car park in Hutton-le-Hole at 8-30am, after bacon butties courtesy of Ron. Headed into Farndale through Low Mill and onto Church Houses, where we stopped at 10-55 for 2 pints of very enjoyable "Black Sheep" at the Faversham Arms. Climbed steeply out of Farndale, where Cliff returned a new born lamb to its mother. Some "Heather Bashing" towards the top then dropping down into Rosedale, stopping for lunch at the White Horse Farm Inn at Rosedale Abbey with a further 2 pints of "Black Sheep". Rather than heading up the steep road, an alternative equally steep path was taken to meet the track to Ana Cross. 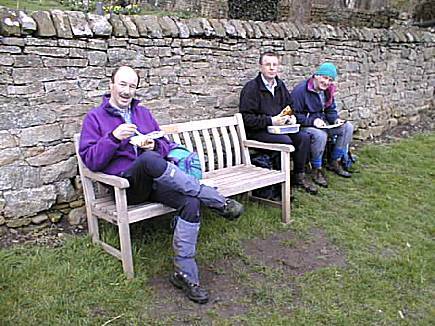 Continued to stop briefly in Lastingham village to finish our sandwiches before the last leg of our walk. Entered the centre of Hutton-le-Hole by an alternative route and stopping for an ice cream. Weather: Fine, cloudy in the morning with a cold wind on the tops, but better in the afternoon. Walkers: Ron, Neil, Alan E and Cliff. NEWTONDALE TRAIL - Saturday 18th June. Left Pickering at 08-35, after enjoying Bacon Butties, courtesy of Ron. Arrived Birch Hall Inn at 14:10 leaving at around 15:45 to complete the walk to Grosmont in time to catch the 16:50. Walkers: Ron, Neil, Alan E, Alan J & Sean. SWALEDALE/ARKENGARTHDALE - Saturday 16th July. 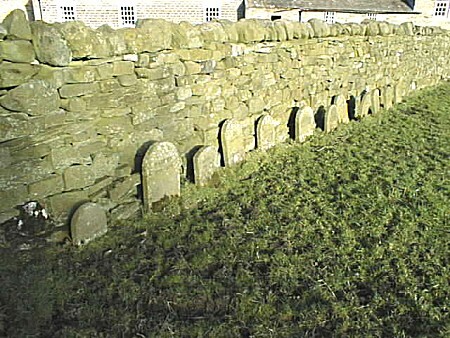 Having met at Cliff's brother's between Reeth and Grinton we proceeded to Marrick Priory. Up the steps to wonderful vistas along Fremington Edge....Does anyone have a clue as to what chirt was used for? The walk along the top was excellent with glorious views all round. Dropping into the valley we proceeded to the Red Lion at Langthwaite where a couple of pints were consumed before moving on up the road to the CB Inn. Ron, having broken his 9 week drying out period was all for an all day session but Cliff dragged us onwards after 2 more pints. 700 feet of ascent before returning through Reeth (A minor deviation in route due to a none too distinct footpath!). All agreed it had been an excellent day. Thanks Cliff for the planning, and thanks to Ron for the obligatory bacon butties to start the day. Walkers: Ron, Neil, Cliff (Leader), Sean. Weather: Excellent, bright, fresh breeze, very warm in the valley bottom. WOLDS WAY WALK - Saturday 20th August. Met at Cliff's caravan in the Wolds Way Caravan Park at 8:30am for excellent Bacon and Sausage Butties, courtesy of Audrey. Left at around 9am heading initially along the Wolds Way, then turning steeply downhill heading towards and into Winteringham. Then after a short road section, followed superb countryside past neat tidy farms through to Kirby Grindalythe and on to the delightful little village of West Lutton for a lunchtime stop at the "Three Tuns". 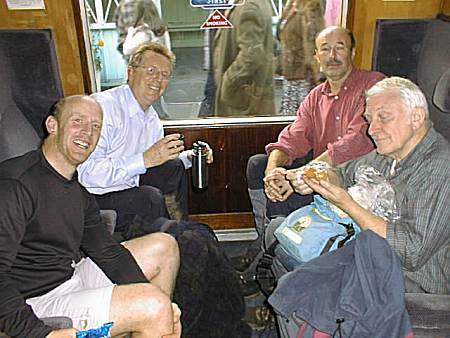 Here 4 pints of Tetleys were throughly enjoyed by all the walkers, in the company of the landlord Roger. Left the pub to head northwards alongside large fields of almost ripened wheat to eventually join the Wolds Way to head back to the caravan park. Voted by all the walkers to be another very enjoyable walk planned by Cliff. 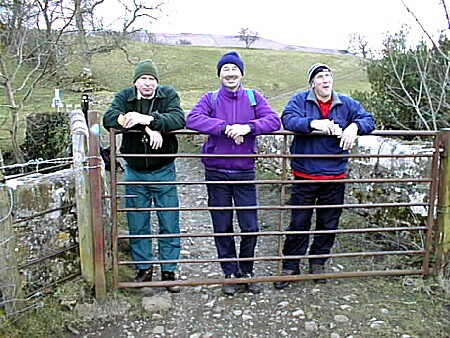 Walkers: Cliff (Leader), Ron, Neil & Alan E.
Weather: Started slightly dull and windy, but turned into an excellent sunny day. 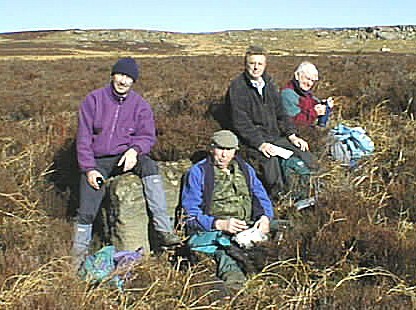 Met at Grimwith Reservoir car park just before 8.30am to enjoy excellent Bacon Butties, courtesy of Ron - Departed at 8-40 to walk around the reservoir, then on towards Hebden stopping for elevenses just after crossing the River Wharfe on the stepping stones. 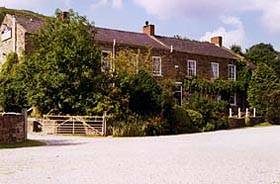 Continued alongside the River Wharfe through Burnsall and on to pub stop, just before midday, at the Craven Arms at Appletreewick, where 4 pints of Follies Ale and Timothy Taylors were enjoyed in the warm sunshine outside. Departed the pub to walk along the road to Skyreholme, then past Parcevall Hall up into Trollers Gill (a bit of a slog), where at a further stop we finished our sandwiches and Sean shared his Pork Pie. Continued through Trollers Gill and up to Stump Cross Caverns before crossing the main road and heading back to complete the walk at Grimwith. Walkers: Ron, Neil (Leader), Cliff, Sean and Alan E.
Weather: Cold on arrival, but bright sun most of the day and very little breeze made it an excellent walking day. Left Pickering at 08-30, after enjoying Bacon Butties, courtesy of Ron. Arrived Birch Hall Inn at 14:30 leaving at around 16:00 to complete the walk to Grosmont in time to catch the 17:00. However as the trains were running approximately 1 hour late, tea and cakes were enjoyed in the Station Cafe. Finally left Pickering car park at 19-15. Weather: No rain, but still and very humid, particularly through the forest sections. Some low cloud across the moors. Walkers: Ron, Neil, Colin, Alan E, & Sean. Left Pateley Bridge at 8-45am after enjoying Bacon Butties, courtesy of Ron. Followed alongside Gouthwaite Reservoir climbing up to follow the long path to the Shooting Lodge, where we were able to shelter from the strong wind in the old stables for our sandwiches. Dropped down to join the Nidderdale Way to Lofthouse, stopping for a number of pints of Black Sheep with Clive in the Crown Hotel. Rushed back to Pateley afterwards as Cliff needed to get back in time for dinner out in the evening. Weather: Damp and wet underfoot, but with incredible Rainbows. Departed around 9am after Bacon and Sausage Butties with mulled wine, courtesy of Cliff. Walked through Leyburn and along the "Shawl" dropping down to go through the Bolton Hall Estate. 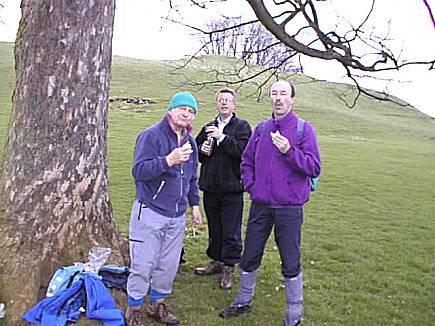 All the walkers much enjoyed quantities of an excellent home made Pork Pie provided at the 11am stop by Cliff. Much refreshed we headed upwards to the "Gallops" at Middleham, later dropped down to meet River Cover at Hulo Bridge and then following it to arrive at the Coverbridge Inn for several pints of Timothy Taylor's (5, except Colin). Afterwards headed back to the cars, arriving just before dark. Weather: 3 to 4 inches of crisp fresh snow. Snowing slightly during the morning.